When I first joined LevelTen, I had no prior experience with Drupal and I knew the internship was going to be a learning experience from the start. Now that I'm in the last week of the program, I didn't realize how much I would learn outside of Drupal. Like how to be a more efficient developer, how to develop proactively in a remote environment, learning the design process from start to finish of a website, and the business aspect of working in web development. Below I describe these learning experiences in a bit more detail. Before joining LevelTen, I didn't utilize the tools available to developers in 2017. Now I'm using graphical interfaces like SequelPro for managing SQL databases, Tower for managing git repositories, and WebStorm as a professional IDE. These tools allow me to be a much more efficient programmer overall. I also had the opportunity to work with agile project tools like PivotalTracker and Trello, these tools will allow me to work more effectively with development teams in the future. I realized how important it is to have a proper design process when developing any website. It is even more important when designing a Drupal site, since there are so many pieces involved. This process goes all the way up to the project leads, project managers, etc. These individuals work with the client to identify goals for the site and the overall scope. Passing that information down to a site designer, who creates a composition such as a sitemap or a wireframe, and a style guide with all the visual elements, patterns, etc. for the site. That information then gets passed down to the developers. Who then develop, test, and produce the site. I used to wonder why companies aren't using the latest and greatest frameworks, environments, etc. Essentially, the cost has a lot to do with the flow of development, and the environment that is used. A good example of this I can give is with Drupal 8. 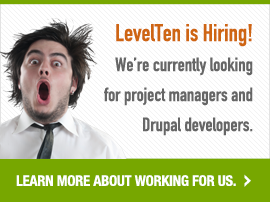 It has been out for quite a while now, but many companies, including LevelTen are still using Drupal 7. What I learned is that it all boils down to time and cost. As well, as the return on investment when upgrading to a newer framework. Also noting that sometimes upgrading to newer frameworks/systems will diminish the amount of open source support provided. 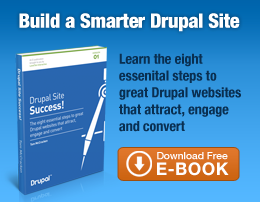 Drupal 7 to Drupal 8 is a perfect example. Even with trending frameworks like ReactJS, AngularJS, Bootstrap 3... I've noticed that companies will wait as long as possible because they simply don't have the time, labor, and funds to train/hire developers, and re-design their systems. I would like to thank the LevelTen team, and especially Kyle Taylor the Senior Developer. I've asked a lot of "nooby" and silly questions over the 8 week program, and Kyle put up with all of it. He has really taught me a lot about the industry, and was like a mentor to me. I look forward to having the opportunity to work with him and the LevelTen team in the future.